K-pop boy group Wanna One returned with its new -- and probably last -- album on Monday, eliciting a mix of excitement and sadness among its fans. The project boy group, comprised of 11 winners of music channel Mnet‘s idol competition show “Produce 101,” started its group activities in August 2017 for a limited time, with its deadline set at the end of this year. The new album, “1¹¹=1 (Power of Destiny),” is the group’s first full-length album. It has so far dropped two EPs, “1×1=1 (To Be One)” in August 2017 and “0+1=1 (I Promise You)” in March; the repackaged album “1-1=0 (Nothing Without You)” in November 2017; and the special album “1÷X=1 (Undivided)” in June. 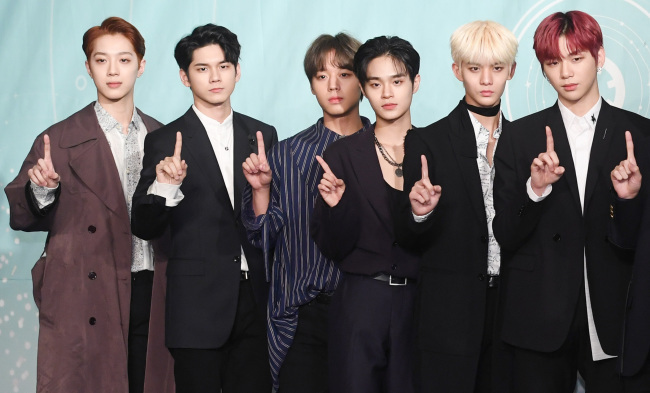 The latest album with 11 tracks shares the 11 boys‘ cherished memories and unforgettable musical journey for the past two years, and their strong will to overcome sorrow and fear and face the destiny of disbandment, it said on its album. the title song of the group’s first EP, and iHwak, who wrote “Light” off the special album, the song contains each member‘s yearning for “a reunion by destiny” in the future like their meeting on the popular competition show, member Hwang Min-hyun said during a press conference for the latest album in Seoul on Monday. With the deadline for parting ways approaching fast, the group was naturally bombarded with questions about the disbandment and future plans. Most members, however, appeared to evade answering them. “This is our first LP, so it is too early to talk about the end. We haven’t talked about the issue sincerely. We will do so after finishing promotional activities for this album,” Lee Dae-hwi said. “It was such a fun journey. We had many fun challenges, and I have no regrets. At this moment, I want to only think about how we will try harder for our future stages,” vocalist Kim Jae-hwan said. Kang Daniel, arguably Wanna One‘s most popular member and the winner of “Produce 101,” was more straightforward about the group’s future. “It feels bittersweet. It feels good and sad at the same time. It is complicated,” he said. The group has recently returned from a trip to Thailand, where, according to Kang, the members opened up and talked candidly about their journey together, each member‘s individual struggles that they hadn’t previously shared and how much they appreciated fans' love and support. “The process of preparing for this album was like running a marathon. It feels like we are now running past a water station and gearing up for one last sprint. We will run harder, faster, for our last stage,” he said.